Spending New Year’s Eve in Times Square for the ball drop is a Bucket List item. Now, if you ask a New Yorker for New Year’s Eve in Times Square tips, they will most likely scoff that it is a crowded Tourist Thing natives just don’t do. That’s a shame. 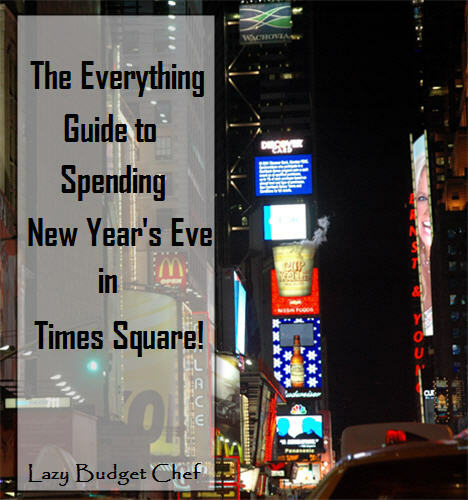 Being in Times Square on New Year’s Eve for the ball drop makes for a long day and evening but it is definitely something you should do at least once in your life! Fortunately several years ago, Husband and I flew to New York with friends to cross a Times Square New Year’s Eve celebration off of our collective Bucket Lists. Today, I’m writing the New York Times Square New Year’s Eve travel guide we wish we had as reference during our vacation. 2. The best view is right up front at The Bowtie (42nd Street to 47th Street where Broadway and 7th Avenue intersect.) This is the area you see full of people when you watch it on TV. They block off the area from 6th Avenue to 8th Avenue sometime in the afternoon (usually around 3pm.) People who want the best spot start showing up at 1 pm. Our group headed down there at 1pm milled around a bit so when the NYPD started blocking off the streets at 3pm we were right there and able to get a good spot. It is first come first served. 3. The subway is the best way to get to Times Square for New Year’s Eve (actually it is the best NYC travel option year round IMHO.) Try to avoid getting off at the Times Square/42nd Street station because it will be insanely crowded! We found it best to get off the train one stop before the Times Square station and walk the rest of the way. The # 1, 2, 3, 7, A, B, C, D, E, F, N, Q, R, W, V and S shuttle subway trains all service the Times Square area. Double check www.mta.info for transit information before you go to make sure your planned stop isn’t closed depending upon the security situation of the day. Sad, but in some years true. 4. You will have to go through a security check before you are allowed to stake out a space. The NYPD sets up gated areas, our group called People Pens. Before they let into a People Pen, an officer wands you down and checks that you don’t have prohibited items such as large bags, backpacks, glass bottles, or alcohol (again check the New York Times Square website because the list may change from one year to the next.) Once they fill a People Pen, they close it off and open one behind it. Once you are in your People Pen, If you leave, you lose your spot. 5. Use the bathroom before you go. They will not have porta potties at the event. If restaurants are open (our People Pen was next to the Times Square McDonald’s) they usually close their restrooms to everyone, including customers. Remember, If you leave your area, you lose your spot. They will not let you back into your People Pen. 6. Eat before you go and bring snacks. There aren’t any street vendors selling food and if you leave to get food you lose your spot. You can bring food with you but it has to be on your person. No glass bottles or alcoholic beverages allowed. A bottle of water to slowly sip throughout the evening isn’t a bad idea. I got too dehydrated towards the end of the evening because I didn’t bring anything to drink with me (I am cursed with a bladder the same size as a hamster’s.) Fortunately a friend gave me some of his bottled water so I didn’t have to go back to the hotel and miss everything. 7. Go with a group if you can. It is easier to hold your spot in your People Pen with a group. You will have more people you know to pass the time with as you wait (and wait and wait.) Bucket List moments like this are made even better when enjoyed with friends! 8. Dress in layers and wear comfortable shoes. Do you know why everyone you see on TV in Times Square is jumping around? It’s not due to excitement but because they are cold! (or that might just have been my reason because I doubled up on everything except socks and my toes were ice cubes by 11pm!) Dress warmer than you think necessary. 9. Bring something to do. You will be standing outside anywhere from 8 to 11 hours before the ball drops. After the first hour or two that gets real old real quick. Smart people in our People Pen brought a blanket so they could play cards. Others brought books. I brought camera gear and took a zillion photos because I’d never get another opportunity to take photos from the middle of the street and not have to worry about being run over by a taxi. 10. Don’t count on your phone as something to do. It will be hard to get a signal because everyone else is using their phone for something to do. Not to mention constant gaming and social media apps kill your phone battery. Leave enough juice in your phone to take a New Year’s selfie with the confetti all around at midnight! 12. You can’t bring in alcohol. So don’t. Although that didn’t stop a group in our People Pen from drinking too much before they got to Times Square and the rest of us had to deal with their obnoxious behavior all. night. long. 13. They raise the ball at 6pm and start handing out sponsored swag. This is when coming in a group is handy. We sent Husband the runner to the sides of our People Pen to get silly hats while we held our spot inside the People Pen. After they raise the ball, every hour on the hour, they play a animation on the Jumbotron of how many hours we have to go until midnight. 13. Unless you are directly in front of it, you won’t be able to see or hear the TV hosts doing live shots or musical performances on the New Year’s Rocking Eve stage. The performances start at 8pm and are not a continual concert like they lead you to believe on TV. The talking heads are in TV studios in the building looking over Times Square so don’t expect to see them either. They don’t announce who or when an artist or group are performing, from our spot across the street it just sort of happened. 15. Add a wish to the Wishing Well and it will rain down on revelers in the confetti at midnight. Visit the Wishing Well website to have your resolution or wish for the new year written on a piece of confetti that will be dropped on the one million people who celebrate New Year’s Eve in Times Square. This wasn’t available when I went. But you and I can do it this year from where ever you will be ringing in the New Year. 16. Times Square clears out quickly after midnight and the subway will be crowded. After the last of the confetti falls and New Year kisses end, NYDP allows everyone out of their People Pens at the same time. To avoid crowded stations and a long wait for a train, we planned to walk to the subway station after the Times Square station to get a train. We ended up walking back to our hotel instead because it felt good to walk after standing for so long. 17. The Times Square Alliance sanitation crew are ninjas. You will not believe how quickly they clean up the tons of confetti and miles of gates as soon as people are allowed to leave Times Square after midnight. The next morning we couldn’t find even a stray piece of confetti while we were standing in line at the Times Square TKTS booth. Impressive! 18. Hotels will be even more expensive for New Year’s Eve. New York is an expensive city to begin with and just like everywhere else prices go up during the holidays. Especially if you want to book a hotel room with a view of the ball on Times Square. We got a small break on our flight and hotel by booking them in August. 19. The most Times Square hotels and restaurants will have New Year’s Eve parties if you don’t want to stand outside and wait for the ball to drop. You’ll pay for the privilege though. Prices range anywhere from $300 at Applebee's to $3,500 to a guaranteed view of the ball at the Marriott. 20. Beware of scammers selling all access passes or party tickets. It is free to stand outside and wait for the ball to drop in Times Square. Make sure you thoroughly research anyone and the event if sometime is trying to sell you a ticket like this because chances are it is fake.